The video above explains AMV editing in its most basic form. #3 take certain parts out of the anime episode and place it on the song. But not everyone makes the same video and some are better than others. 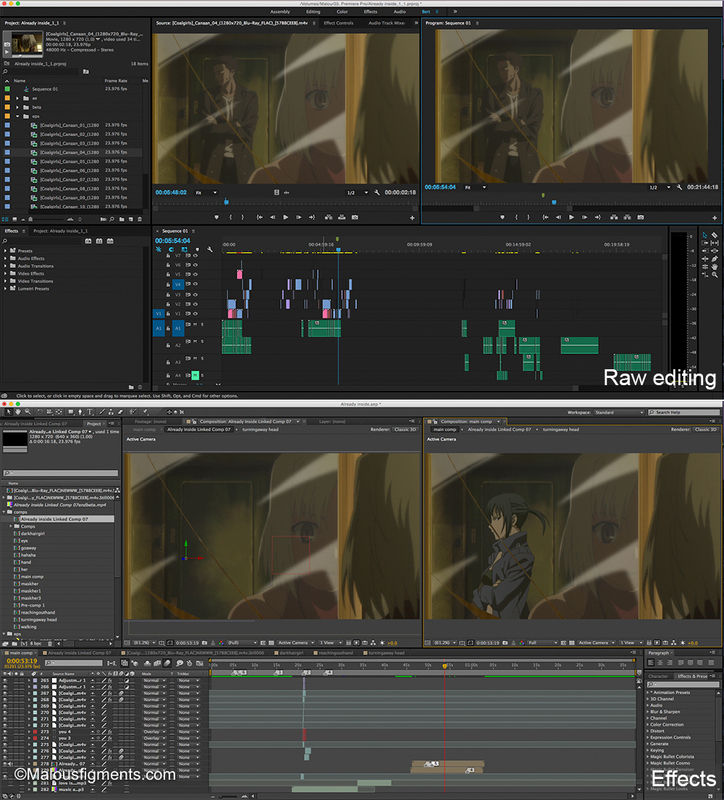 Many people don’t realise how time consuming it is to make an AMV and if you don’t use explosive effects it is likely that outsiders don’t even know what you’ve edited. Sometimes editors make ‘making of’s’ of their videos. Two examples can be found here and here. I myself use Adobe Premiere Pro and After Effects to make my videos. You can do a lot more depending on the program that you’re using. However, you can only get better by editing, trying out and gaining experience as you go. When I stopped making fan videos of Avatar The Last Airbender, I started making fan videos with anime. During my time as an Avatar editor, I met editors from all over the world. This wasn’t any different in the AMV community, but the community turned out to be way larger. Whereas the Avatar community had one or two studios, the AMV community had dozens and it only kept on growing. Because it takes so much time to make these videos, editors started collaborating. There are collabs between only two people but more common nowadays are Multi Editor Projects (MEPs). One (often complete) song is cut up in several parts and each part gets made by another editor. There are also studios: groups existing of 8+ people that often create MEPs on a regular basis. Studios often have group chats in Skype and can have their own forum. Members of a studio have matching icons and banners. AMV editors upload their videos on Youtube, but there are a whole lot of contests outside of Youtube that you can participate in. These contests can be international, as well as local (when you go to a local anime convention for example). I never participated in such a contest because I like to stay out of pressure. What once started out of a desire to enhance my Avatar experience turned into a way to personally express myself. I enjoyed watching anime, but it barely ever gave me the urge to edit because of the anime itself. My urge to edit came from songs; songs with lyrics that expressed how I felt. For me, Anime Music Videos are a way to express myself.